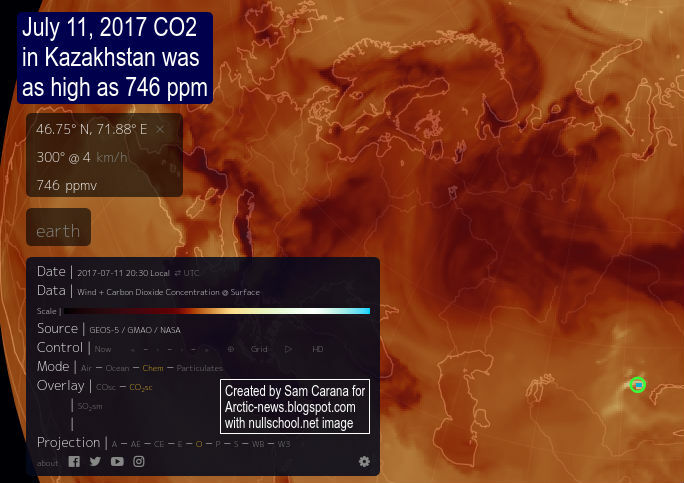 Levels of carbon dioxide (CO2) in the atmosphere are accelerating, even though emissions from fossil fuel burning have remained virtually the same over the past few years. One of the reason behind this is accelerating emissions from wildfires as temperatures are rising. 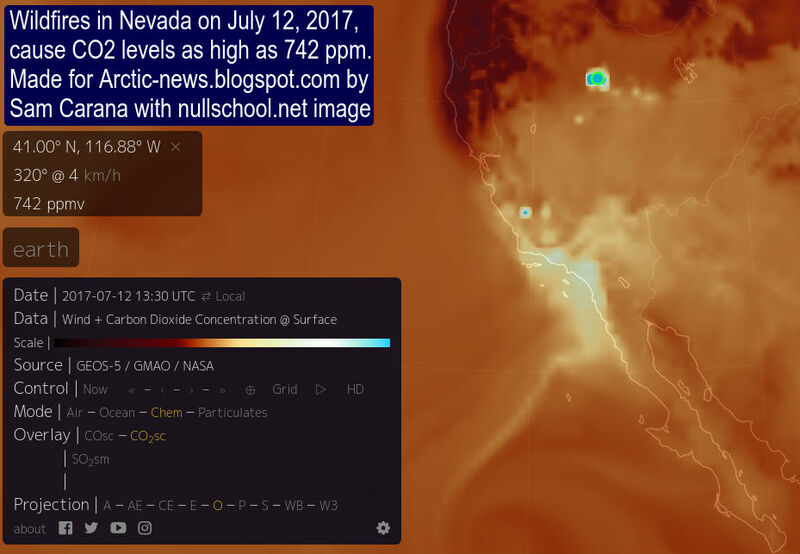 Wildfires in Nevada caused CO2 to reach levels as high as 742 ppm on July 12, 2017 (green circle image on the right). Global warming is greatly increasing the chance for what was previously seen as an extreme weather event to occur, such as a combination of droughts and storms. Heat waves and droughts can cause much vegetation to be in a bad condition, while high temperatures can come with strong winds, storms and lightning. Wildfires cause a range of emissions, including CO2, soot, methane and carbon monoxide (CO). 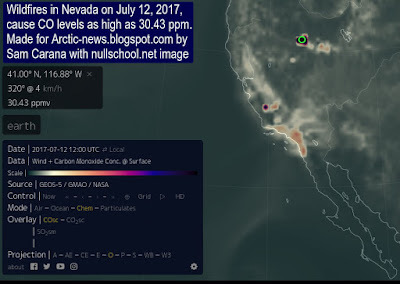 In Nevada, CO levels were as high as 30.43 ppm (green circle image right). Above satellite image below shows the smoke plumes and the charred area. 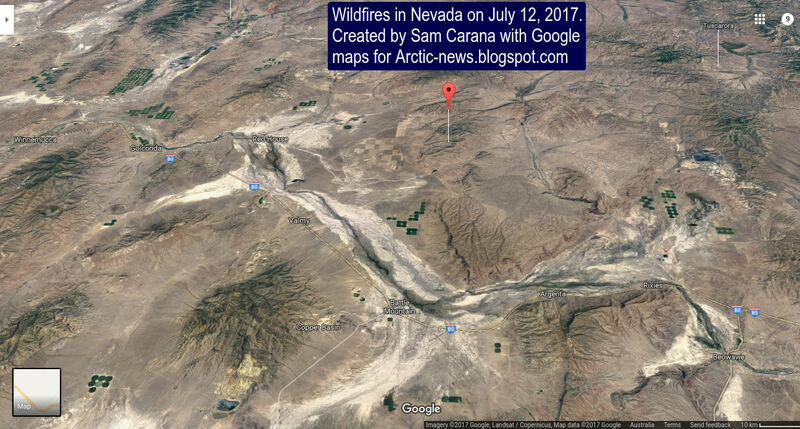 The google maps image below further shows where the fires were burning. At the moment, wildfires are hitting many places around the world. 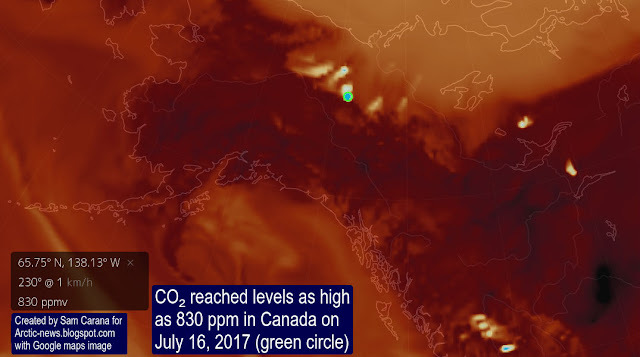 Wildfires caused carbon dioxide to reach levels as high as 746 ppm in Kazakhstan on July 11, 2017 (green circle on image on the right). 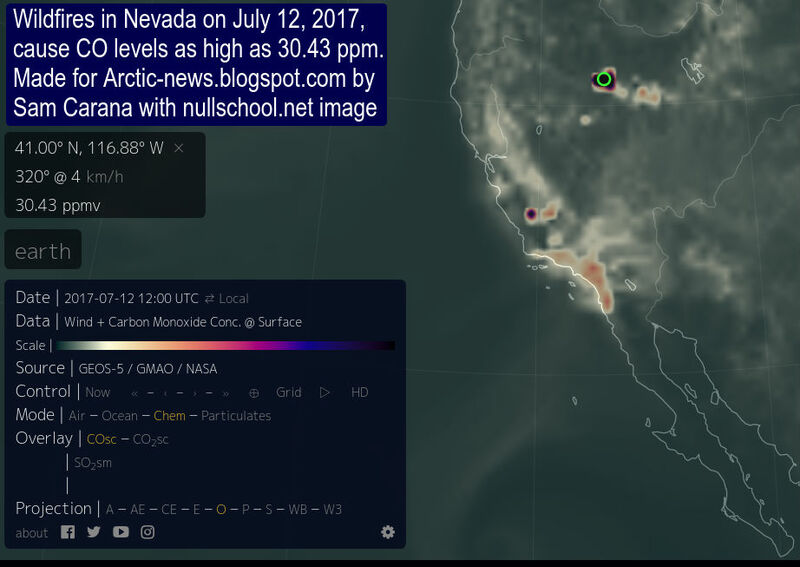 Carbon monoxide levels in the area were as high as 20.96 ppm on July 10, 2017. 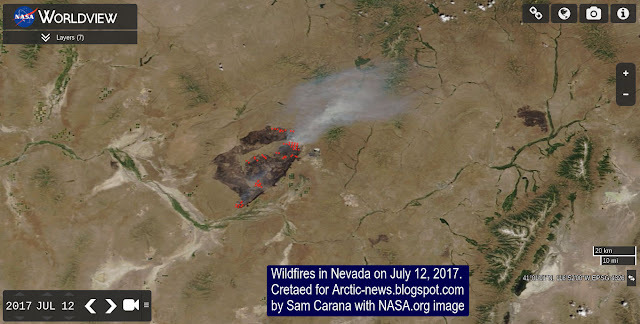 The satellite image shows wildfires in Kazakhstan on July 9, 2017. The satellite images show wildfires in Kazakhstan on July 11, 2017. On July 16, 2017, CO₂ reached levels as high as 830 ppm in North America at the location marked by the green circle on the image below. Note that fires are burning at multiple locations. The image below shows the location (red marker) where the fires burned in Canada. 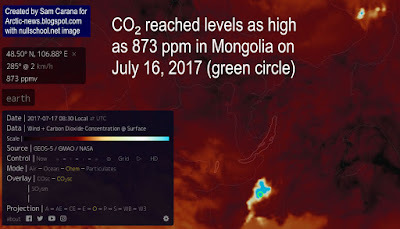 That same day, July 16, 2017, CO₂ reached levels as high as 873 ppm in Mongolia, as shown by the image on the right. The image also shows further fires burning in Siberia. 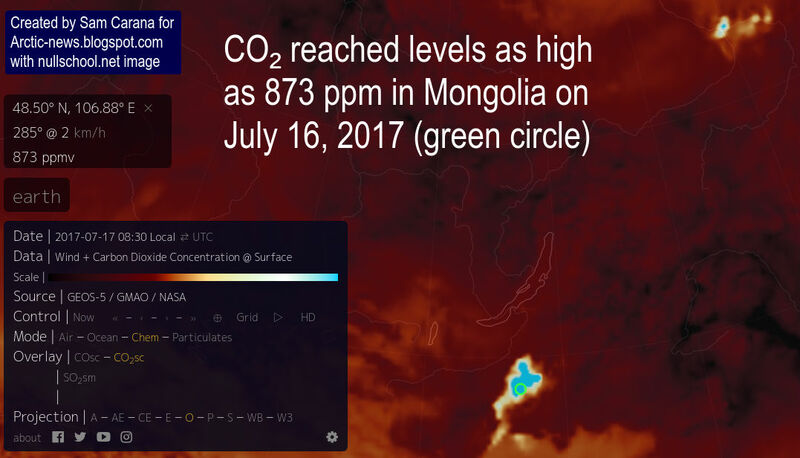 Carbon monoxide levels were as high as 37.19 ppm where the fires burned in Mongolia on July 16, 2017, as shown by the image below. The image below shows the location (red marker) where the fires burned in Mongolia. The image also shows Lake Baikal across the border with Russia. On July 22, 2017, CO₂ reached levels as high as 1229 ppm in Montana, while CO levels at the time were as high as 56.38 ppm at that location (green circle on image below). NASA post Grassland Fires Tear Through Montana. 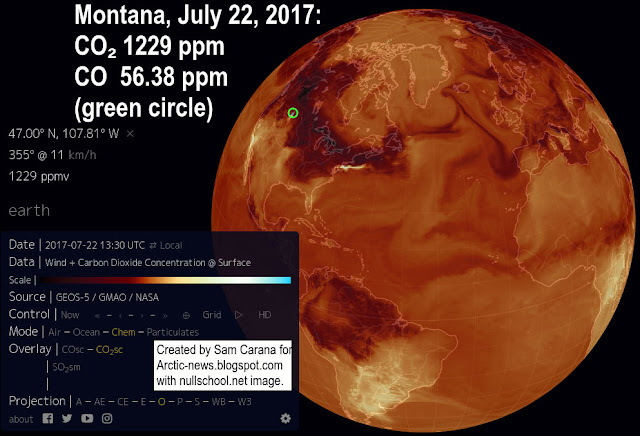 Furthermore, on July 23, 2017, CO₂ reached levels as high as 884 ppm at another (nearby) location in Montana (green circle on image below). Meanwhile, temperatures keep rising. Surface temperature as high as 53.1°C or 127.5°F were forecast in Iran for July 11, 2017, at the location marked by the green circle on the image below. At 1000 mb (image below), temperatures in Iran were forecast to be slightly lower, i.e. as high as 51.9°C or 125.3°F at the location marked by the at green circle, but note the difference in color, especially over Greenland, the Himalayas and the Tibetan Plateau. 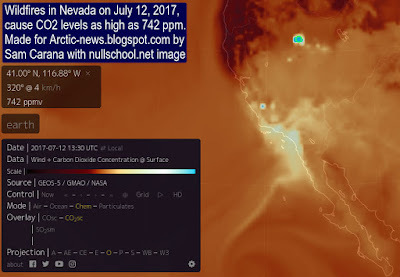 The net warming effect of open biomass burning was estimated in a 2014 study by Mark Jacobson to amount to 0.4 W/m² of radiative forcing. Imagine a scenario in which many people stopped burning fossil fuels for heating, cooking and energy. That would be great, but if many of them instead switched to burning biomass in woodburners and open fires, while wildfires increased strongly, the net warming from associated aerosols would increase dramatically. A recent paper by James Hansen uses equilibrium fast-feedback climate sensitivity of ¾°C per W/m², while another recent paper suggest that the temperature rise per W/m² could be even stronger. 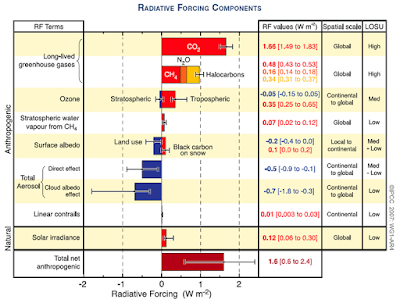 A high-end increase in net radiative forcing combined with a strong temperature rise per W/m² could cause a temperature rise as a result of changes in aerosols of as much as 2.5°C in a matter of years, as suggested in earlier posts such as this one. • Impact of anthropogenic climate change on wildfire across western US forests, by Abatzoglou et al. • The Mean and Turbulent Properties of A Wildfire Convective Plume, by Lareau et al. • Airborne measurements of western U.S. wildfire emissions: Comparison with prescribed burning and air quality implications, by Liu et al. • Hemispheric climate shifts driven byanthropogenic aerosol–cloud interactions, by Chung et al. 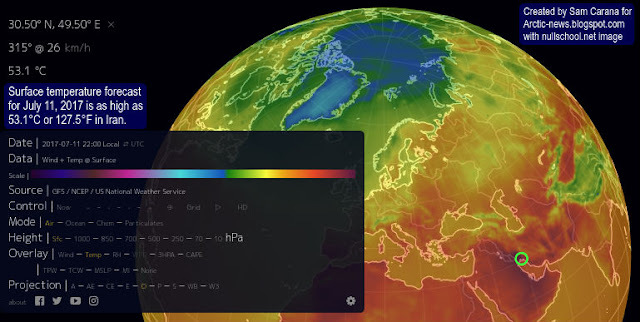 • Amplification of global warming through pH-dependence of DMS-production simulated with a fully coupled Earth system model, by Jörg Schwinger et al. • Role of volcanic and anthropogenic aerosols in the recent global surface warming slowdown, by Doug M. Smith et al. 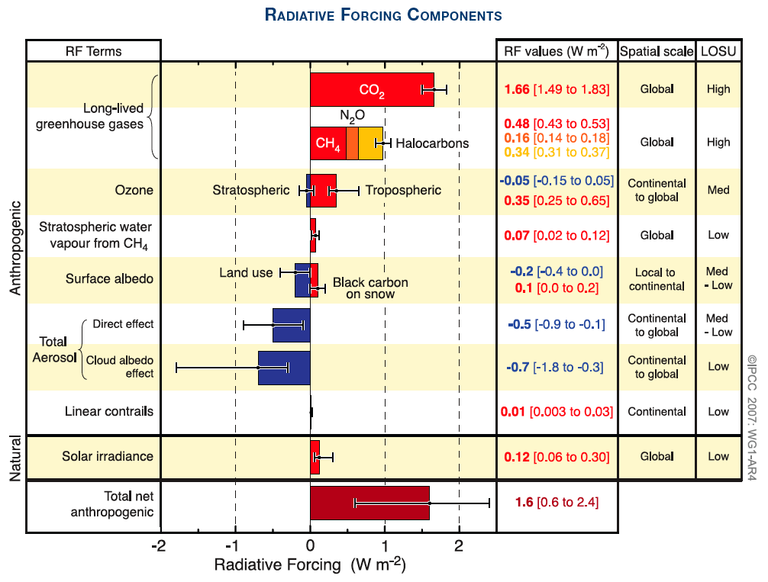 • Slow climate mode reconciles historical and model-based estimates of climate sensitivity, by Proistosescu et al.